When it comes to your career, be the investment. Bundling the global BRMConnect Conference with our Knowledge Offerings is ideal, giving you the perfect opportunity and environment for you to invest in your career. 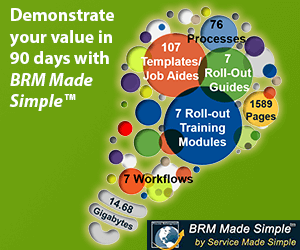 Register for our global BRMConnect Conference now to gain your BRM certification plus much more. Bundle these knowledge offerings with your BRMConnect conference package. The Business Relationship Management Professional (BRMP) course is a 3 day course that immerses the student in the principles of Business Relationship Management. The BRMP training and certification program is intended for Business Relationship Managers, with the training and certification designed to provide a solid baseline level of knowledge. Workshop participants can expect interactive and lively two-day session, with a deep dive into the most common obstacles experienced by organizations working to evolve their BRM capability. Among these topics are Strategy, Culture, Convergence, Making It Personal, Team, and Measurement. The BRM Fundamentals workshop is an introduction to Business Relationship Management as a capability, role, and discipline. This workshop provides a primary basis of BRM understanding to ensure a successful journey through the KPTS. This workshop is designed for anyone looking to understand BRM and its fundamentals, open to everyone, at any level, and in any role that wants to learn more about interacting with and/or how to achieve success through BRM. The Certified Business Relationship Manager (CBRM) Practitioner Qualification is a 4.5 day classroom or online Course that is intended for the intermediate to advanced Business Relationship Manager and focuses on performing the role of Strategic Business Relationship Manager. The CBRM training and certification program is intended for Business Relationship Managers, with the training and certification designed to provide an intermediate level of knowledge. This workshop guides participants through a value approach consisting of a full-cycle value optimization framework that works across business functions to ensure that the organization drives towards business success. The value optimization approach and framework are designed to empower business professionals to share ownership of business value by engaging business partners/peers in idea generation (ideation), value planning, and ensuring business value results through value measuring, optimizing, and communication. Bundling the Conference with your training and certification is ideal, giving you the perfect opportunity and environment for you to invest in your career. When we get right down to it, organizations have very few expenses. Instead, they have an enormous portfolio of investments that live somewhere in the “expense budget.” When it comes to your career, be the investment. When you do so and use BRM tools to manage value, you’ll find that getting training approved isn’t a problem at all.